It's hard to believe Gabe and I have been married for over 4 months. I felt like it was just the other day that I had my Wedding Wednesday posts, giving the details of our big day. I really miss wedding planning and feel like a big part of my life is missing! So I was more than happy to create a Winter Wonderland Bridesmaids board for Weddington Way. I absolutely love the navy, grey and cream color combo. Nearly everything I own is navy (I have a stripe addiction) and would have gone with this theme for my wedding if we didn't get married in New Orleans. You can see all of my actual wedding details here. I selected Dessy 2858 from the Weddington Way Exclusive Chiffon line for the bridesmaid dress. Although my bridesmaids dresses were short, I prefer long dresses. The reason we selected short dresses was also because of the New Orleans wedding. For accessories, I selected Dressy Cz Petite Drop Earrings, the bracelet my girls wore to my wedding, Jim Hjelm 478 Belt and Audrey Brook Taylor Pumps. For makeup, I kept with the navy, silver and cream theme. For the flowers, I had to go with peonies, which I would have selected for my own wedding if it were in Peonie season! 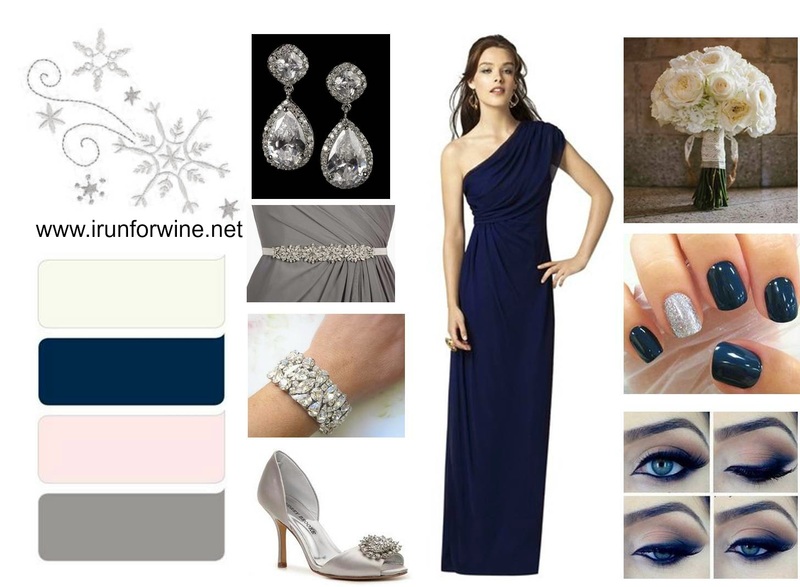 If you were to get married in the winter, what color scheme would you go with?